I was reminded that it's been awhile since I did a Distill Wars post when Episode V: Beefeater vs. Tanqueray started trending a few weeks ago for some reason. Yeah, it's been awhile since the last installment... but a whole year and a half? Damn, man! I've been slacking on Distill Wars! Let's fix that right now! I have purchased three nips of orange liqueur, AKA "triple sec". Stock Gran Gala, Cointreau, and Grand Marnier. Let's do the weigh-in before we get them in the ring to duke it out. Coming in at just $1 for a 50ml nip, Stock Gran Gala hails from Trieste; the capital city of the Friuli Venezia Giulia region in northeast Italy. It's made from VSOP brandy and sun-ripened Mediterranean oranges, and has an ABV of 40%. Stock does some pretty damn good cheaper alternatives to higher end products. For example: their Amaretto opposed to Disaronno, and their Vermouth opposed to Martini & Rossi. Relax, I said "cheaper alternatives". 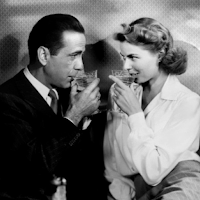 The true star of the movie Casablanca, Cointreau weighs in at around $4.50 for a 50ml bottle. Out of Saint-Barthélemy-d'Anjou in western France, it was first released in 1875. It begins as a spirit made from sugar beets, then it's distilled twice more with sweet and bitter orange peels. It is purposely drier than its competitors, such as Grand Marnier. The ABV is 40%. And our last competitor is the famous Grand Marnier Cordon Rouge, coming in at $4 for a 50ml nip. Founded in France's Saint-Barthélemy-d’Anjou in 1880, Grand Marnier is actually a "curaçao" instead of a "triple sec" because of the type of bitter oranges that it uses. The alcohol comes from Cognac, and it also has a 40% ABV like the others. Alright, first appearances. Cointreau is clear, as it was distilled with the orange peels. The other two look like apple juice, with Gran Gala being a little darker than Grand Marnier. On the nose Gran Gala smells literally like fresh juicy oranges. Actually the first thought that came into my head is clementines just because I eat those tasty little fuckers all the time. Cointreau smells like the orange peel and has a little white pepper aroma to it as well. 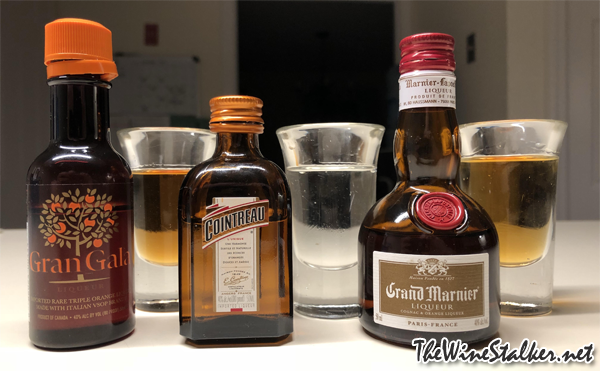 The Grand Marnier goes back to the aromas of the actual fruit of the orange, but you can smell the booze and there's an agave-like aroma that makes me think of Tequila. In the mouth Gran Gala is thick and syrupy, and it burns going down. It tastes just like hard orange candy. Cointreau is lighter and goes down smooth without any burn. It tastes like hard orange candy and Ricola honey-lemon cough drops. Grand Marnier's body lies between the two. 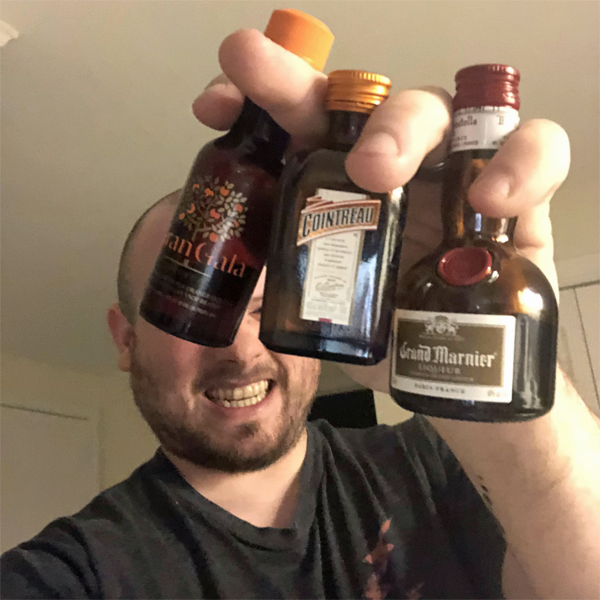 There's flavors of hard orange candy, lemon-lime candy, agave, a hint of black table pepper, and a bit of bitter orange peel on the back end. It burns on the tongue, but not nearly as much down the throat as Gran Gala. This is a no contest. The winner is clearly Grand Marnier. It's much more complex and on a different level of quality than the others. And it's going to offer far more flavor and character to cocktails than its opponent. 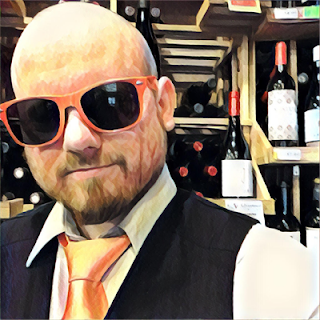 However, even with Grand Marnier taking the win, I think I'd personally prefer to sip Contreau neat because of its approachability. Neat! I forgot how fun Distill Wars really is. Let's do this again sooner than another year and a half, okay? Yes, it has been quite long. Nice to see that you are back. Don't go on such a long hiatus again. I enjoy reading about the 'Distil Wars'.